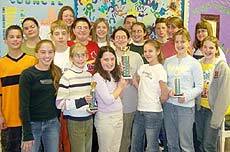 [APRIL 11, 2003] Members of the Zion Lutheran School Math Bowl team received the overall first-place team trophy at the annual Lutheran High School Math Bowl in Springfield on April 5. Lutheran schools from central Illinois participated in the competition. Zion Lutheran competed in four divisions: fifth grade, first place; sixth grade, second place; seventh grade, first place; and eighth grade, second place. Team members include fifth-graders Kathryn Opperman, Josh Kastendick, Raeann Sheley, Scott Carnahan and Jordan Barr; sixth-graders Samantha Lambros, Brittany Rogers and Katelyn Harmsen; seventh-graders Sabra Boyd, Amanda Podbelsek, Sara Rossetti, Annie Sheley and Jenna Opperman; and eighth-graders David Williams, Joe Heidbreder, Ally Fuiten, Kate Kastendick and Esther Smith. [APRIL 4, 2003] The Lincoln Junior High band has been busy for the last week or two. Band students who performed at the Logan County Solo and Ensemble Contest all earned a first-place rating. The students who attended the contest were Daniel Parson, Jessie Owen, Merideth Laurence, Rebecca Kasa, Hannah Snyder, Lori Knollenberg, Nicki Shehorn and Brittany Reves. Sonya Twist earned two first superior ratings at the Illinois Grade School Music Association Solo and Ensemble Contest in Litchfield, and the entire band received a first-place rating at that contest.